If a child is struggling with poor handwriting and is referred for an occupational therapy handwriting assessment, the outcome of the assessment can show very diverse difficulties. This is because the perceptual-motor foundations of handwriting are numerous and complex. 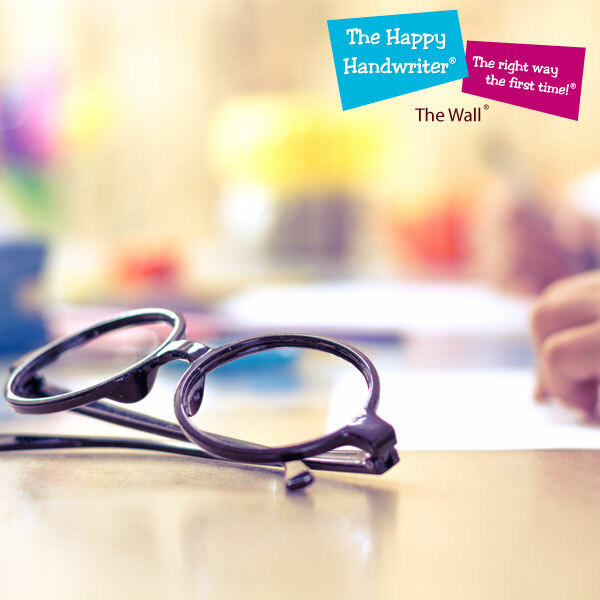 Let’s look at The Wall®, an occupational therapy framework for explaining learning difficulties in children, and see how the foundational skills can impact on handwriting development. The Wall framework shows how the foundational sensory input blocks feed into, and facilitate the development of the different components or bricks. The bricks represent the intermediate components which develop from the sensory input foundations and support the development of the skills at the top. Handwriting is one of the skills at the top of The Wall. 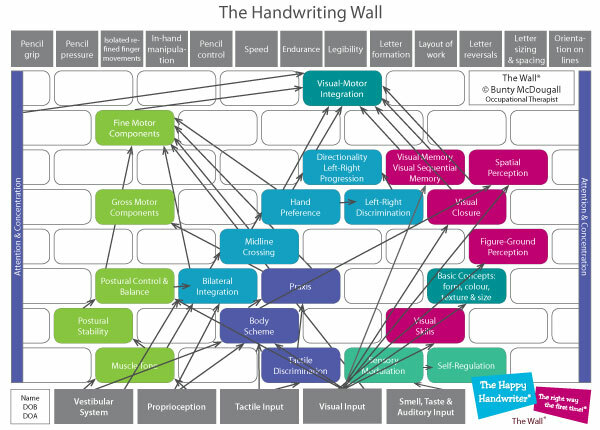 The foundations, inter-connections and links between the foundational bricks for handwriting are very complex. I have simplified them by using colours to show some of the main links. However, it is not a simple as following one group of colours to the top of The Wall – the green connects to the blue which connects to the pink, which links to the purple! 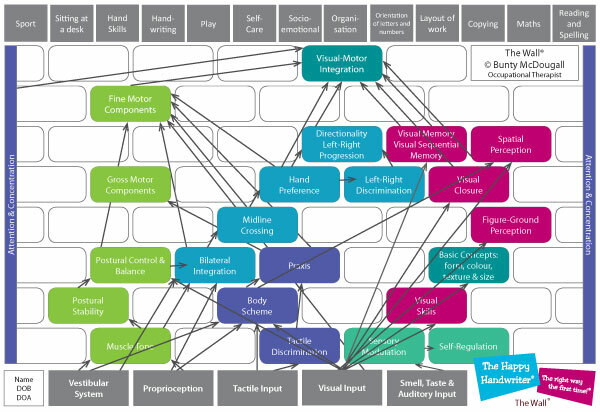 Motor and visual-perceptual development is all interconnected, but it is useful to try and separate it out to understand the complexities of skills such as handwriting so as to guide handwriting intervention strategies. 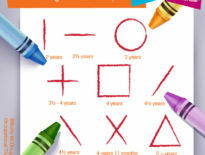 The skills at the top of The Wall, one of which is handwriting, are some of the tasks our Grade 1 children arrive with, or develop through their Grade 1 year. There are many others which may be added but I am focusing on fine motor and handwriting development. Let’s start with the green line on the left. This one finds it foundations in vestibular-proprioceptive functioning which governs muscle tone, postural stability and postural control. The child needs this core stability, along with dynamic and static balance to hold themselves in their seats and position their bodies for handwriting. Lying down on the desk is simply just not going to cut it when it comes to producing fluent, neat handwriting that will enable the child to keep up with the classroom demands. 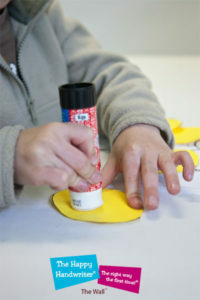 This hampers the development of fine motor skills which are so critical for our children’s handwriting development. Our children need to have developed a hand preference in order to achieve skilled handwriting. The foundations of this are again rooted in vestibular-proprioceptive functioning. This blue group supports the development of bilateral integration, or the ability to use the two sides of the body together in a co-ordinated manner. Midline crossing and hand preference develop from there. Children cannot develop the skilled fine motor refinement required for handwriting without having first developed a hand preference. A Grade R or 1 child without a developed hand preference is seriously at risk for handwriting and future academic difficulties and a referral to an occupational therapist is most certainly appropriate. The development of a good body scheme is the foundation for praxis, otherwise known as motor planning. Shown in the purple group, this ability to plan and execute unfamiliar motor patterns is a critical foundation skill for letter formation and handwriting. So, a handwriting difficulty may be rooted in a planning problem which needs to be addressed in conjunction with teaching handwriting to bring about significant functional changes. Sensory processing is much talked about these days. Some children avoid sensory input and the feel of the paper on which they must write creeps them out. The sensory seekers are so busy flicking, flipping and fiddling with their pencils, it leaves little time for committing things to paper. The modulation of sensory input, or the ability to screen out irrelevant stimuli while focusing on that which is important, is required in order to focus and concentrate on any handwriting task. Sensory processing disorders are pervasive in their impact on all aspects of functioning including handwriting, and their influence cannot be over-emphasised. Both vision, and the visual-perceptual foundations, are critical building blocks for handwriting. Any one of these, shown in the pink group, gone wrong may be the one to bring handwriting development to its knees. Like all other aspects of development, visual-perceptual skills start early on a baby’s life and are continually refined and developed as children develop and mature. It doesn’t matter how good a child’s motor skills many be, if they lack the visual-perception required to analyse how a letter is constructed and formed, they are going to struggle with handwriting acquisition. Preschool teachers address these components in their classrooms every day. But do they know how critical the input they are providing is contributing to ensuring their children are ready for handwriting acquisition? The developmental components can be advanced through carefully crafted play opportunities, of which the preschool teacher is the master. While preschool teachers work on letter formation, it is always the understanding that handwriting acquisition is the domain of the Grade 1 teacher. However, our preschool teachers are often unknowingly fostering the development of all these foundational skills that are going to be built on for fine motor skills and handwriting acquisition. They may not turn the car on and get it driving, but they are the ones who have actively assisted in assembling and fine tuning its parts in preparation for driving, or handwriting. Concentration sits at the sides of The Wall. Without concentration to oversee and bring all the foundational components together, functional handwriting is going to be compromised. In The Wall, I describe concentration as being the Governor that oversees the functioning of the troops. If there is no Governor to keep the show on the road, and the troops quickly fall into disarray. The Wall is most certainly one of my occupational therapy handwriting tools. Following assessment, I plot all the identified information on The Wall and am able to pinpoint which of the foundational areas require attention and intervention. This lightning tour through the perceptual-motor handwriting foundations shows us why between 25 and 30% of children experience handwriting difficulties in the classroom setting. The diversity of the foundations shows us it is such a complex skill – and we haven’t even begun to touch on the linguistic aspects of it. 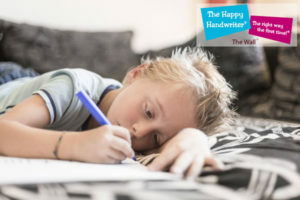 Miss Mancy.com also takes a look at handwriting foundations. 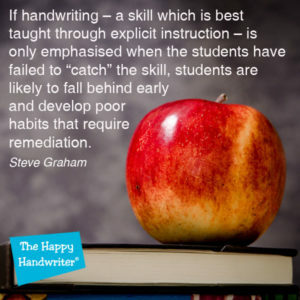 Children with shaky foundations are going to find handwriting acquisition a challenge. Using a solid sensory-motor approach in classroom strategies for handwriting cannot obliterate any foundational deficits but can go a long way to compensating for, and offering our children the best shot at achieving legible handwriting that will serve them through their school years and beyond.